This report by Gary I. Sharp lists information related to the Gourd Neck Springs area of Lake Apopka and a potential purchase of the area by the State of Florida through the Environmentally Endangered Lands (EEL) Program. The report aims to show why the area is suitable for a public park, describing physical and environmental characteristics of the area, as well as summarizing the economic issues related to a public purchase of the area, including zoning information from the Lake County Zoning Department and appraisal values from Danny L. Dulgar. The report also discusses an inspection of the area by the Environmentally Endangered Lands Committee, which rejected the site due to the polluted quality of the lake surrounding the area, as well as its small size. Finally, the report includes hydrological data related to the springs. The Environmentally Endangered Lands Program (EEL) was formed in 1972 as part of the larger Land Conservation Act of 1972. The EEL program was initially funded through the sale of state bonds. The program was designed to help the state acquire lands considered environmentally sensitive and was not designed for creating areas for recreational use. Potential sites for acquisition could be suggested by citizens, county and state governments, and nonprofit organizations. After evaluation for environmental value, potential sites would be approved by the Executive Director of the Florida Department of Natural Resources and finalized by the Governor. In 1979, the former Executive Director, Harmon Shields, was indicted on corruption charges involving the lands-acquisition process. Following this scandal, the EEL program was replaced by Conservation and Recreation Lands Program. This change replaced the program's funding with tax revenues instead of bond sales, and formed the Land Acquisition Selection Committee, made up by six executive directors of Florida environmental agencies, to select sites for approval by the governor. The Division of State Lands was also created as a division of the Department of Natural Resources to oversee mapping and evaluation of potential sites for acquisition. 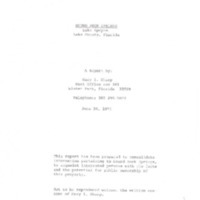 Original 10-page typewritten report: Sharp, Gary I. Gourd Neck Springs. Winter Park, FL: 1975: binder 1975, Friends of Lake Apopka Archives, Ginn Museum, Oakland Nature Preserve, Oakland, Florida. Digital reproduction of original 10-page typewritten report: Sharp, Gary I. Gourd Neck Springs. Winter Park, FL: 1975. Originally created by Gary I. Sharp. "Harmon Shields Indicted." Boca Raton News, May 2, 1980. Accessed June 14, 2016. https://news.google.com/newspapers?nid=1291&dat=19800502&id=IB5UAAAAIBAJ&sjid=mI0DAAAAIBAJ&pg=3814,204016&hl=en. Sharp, Gary. “Gourd Neck Springs Report.” RICHES of Central Florida accessed April 18, 2019, https://richesmi.cah.ucf.edu/omeka/items/show/7836.